PAL and NTSC Jaguars have almost identical mainboards, with one small exception. There is a 0 Ohm resistor (i.e. jumper) placed on PAL machines, bridging a gap which is open on NTSC Jaguars. The difference this makes is that the video output is throttled to 50Hz when the bridge is closed (which is the case on PAL Jaguars) and runs at full 60Hz when it's open. The jumper is relatively easy to find; open the Jaguar case and take the mainboard out of it, then flip it on its back and look for a group of five resistors slightly above the second controller port, as marked on the image to the right. The one you're looking for is the jumper at the lowermost end of the group, the one that's closest to the joypad ports. 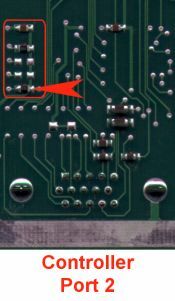 See the image to the left for a closeup of the resistor group with the important one marked. Remove this resistor to un-throttle the video output from 50 to 60 Hz. If you want comfortable, get a two-state switch from your favourite electronics parts store, solder it to the ends of the now-open bridge with two wires. Then, dremel/punch/bite a hole in the front of your Jag case and put the switch there so you can reach it from outside even when the case is closed. Now you have a Jaguar that can be easily switched from 50 to 60 Hz and back.